Happy Monday! I hope everyone had a lovely weekend. I certainly did. However, I am growing weary of our dreary and bitter cold weather around here. I’ve been bitten with the travel bug and I am constantly dreaming of our next adventure, which will hopefully happen soon. (As you may know, I get to live in Italy this year!) Until my voyage across the pond, I shall make do by pretending that I’m drinking tea and munching on Madeleines in some lovely little French bistro in Paris with our friends. While there seems to be some debate over the true origin of the Madeleine cake, there is one thing we can all agree on: they’re light, fluffy, tasty, and downright adorable with their little seashell shapes. Brush Madeline pan with the melted butter and place in the refrigerator for a couple of minutes until the butter has set. Apply another layer of butter, then sprinkle pan with a light layer of flour. Set aside. Melt the 10 tablespoons of butter in a small saucepan over medium-low heat until it begins to brown. Immediately pour into a separate bowl and set aside. Sift the flour and baking powder together in a medium bowl. Sift a second time and set aside. 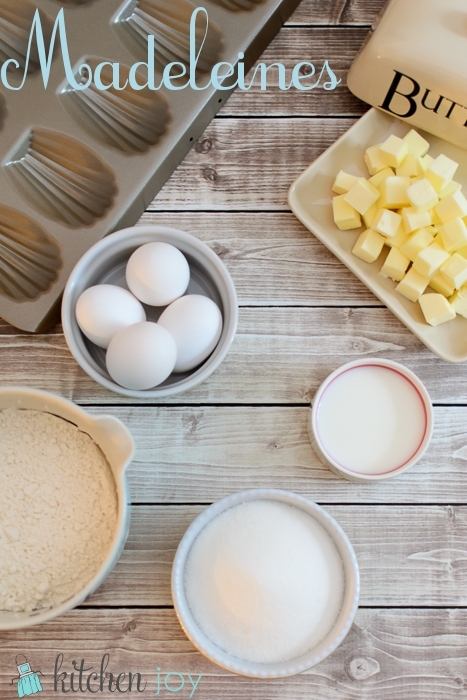 In a large mixing bowl, beat the eggs and and sugar together with a whisk until the mixture is pale in color and creates a ribbon appearance on the surface of the mixture when the whisk is lifted. Pour the milk into the egg mixture and stir until combined. Add the flour and and gently fold in with a rubber spatula. Add 2 tablespoons of the batter to the melted butter and stir until mixture is smooth. Fold this mixture back into the batter. Cover the batter with plastic wrap and let rest in the refrigerator for at least 1 hour. Preheat oven to 465 degrees F.
Transfer batter to a pastry bag fitted with a large plain tip. (You could also use a large zipper bag and just cut the corner off to make a 1-inch diameter opening.) Pipe teardrop shapes that fill the Madeleine molds halfway. 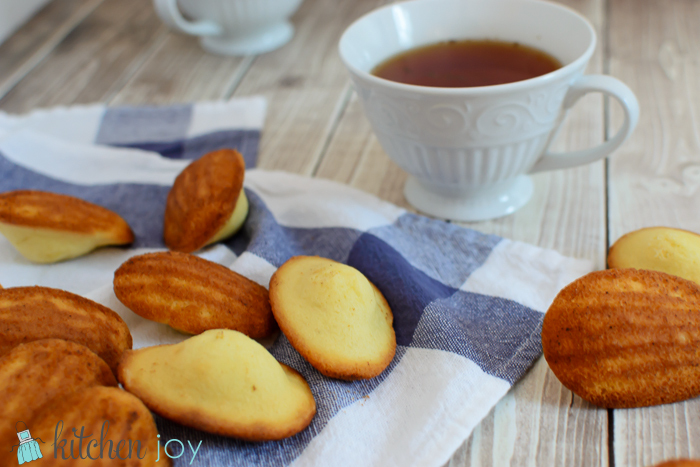 Bake the madeleines for 6 minutes, then turn the oven temperature down to 390 degrees F and bake them until golden brown, 3 or 4 more minutes. 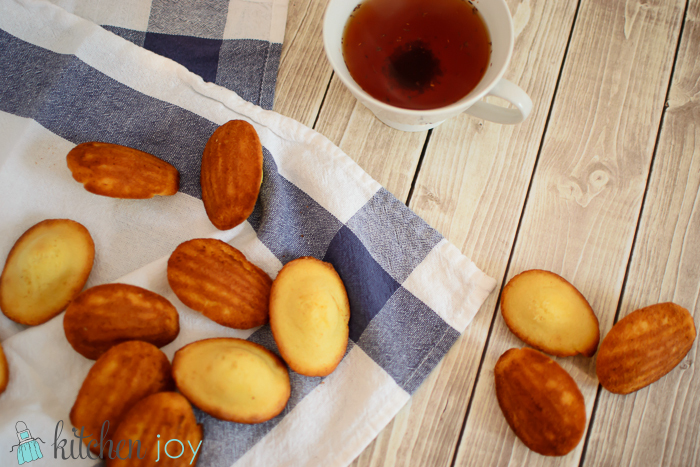 When the madeleines are golden and have formed a bump on the top, remove pan from oven and unmold onto a wire rack. Serve warm or at room temperature. 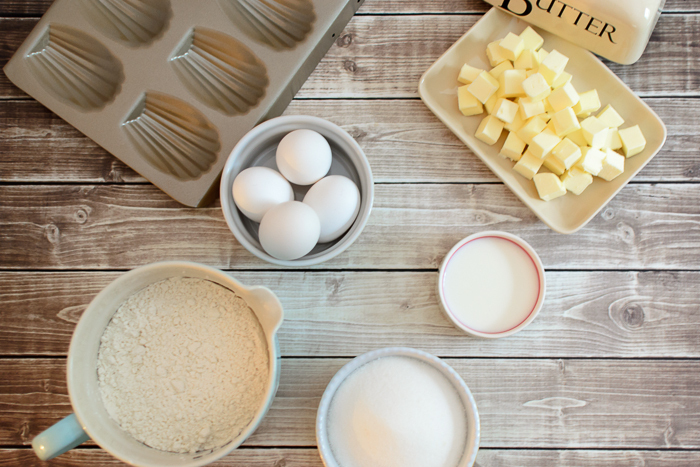 *Tip: Don't be tempted to forgo brushing the pan with butter and flour and spray with cooking spray instead. The high baking temperature will cause the cooking spray to burn, leaving you with an overly dark and unpleasant tasting cake.